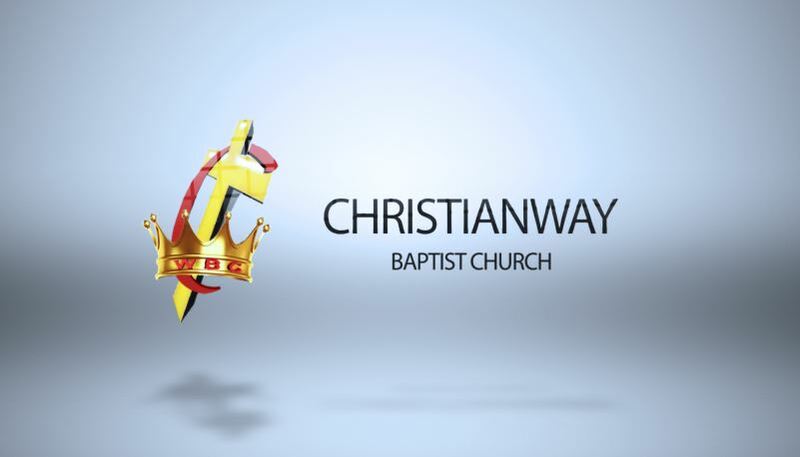 ChristianWay Baptist Church is a small loving congregation with a big heart. We are a family and we worship the Lord in spirit and truth. We serve through our various ministries. Our Church School Ministry is designed to accommodate all ages, as are our many other ministries. 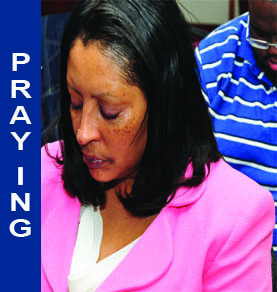 We also have an interactive mid-week Bible Study and Prayer Meeting that stimulates the mind and fuels the soul. Founded in 1990 and currently pastored by Reverend Augustus "Gus" Henderson since 1995. During his short period as pastor the Lord used Reverend Henderson to expand on his ministry. Our church family has witnessed many Baptisms, and has seen God's people returning to the church and renewing their faith to God through Christian Experience under his leadership. Our First Lady Mrs. Jacqueline Henderson has truly been a blessing and an inspiration to both the men and women of this Church through her biblical knowledge, her teachings and through her faithfulness. 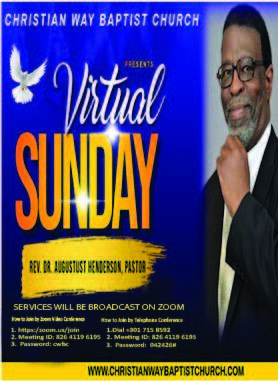 Reverend Augustus (Gus) Henderson serves as the Senior Pastor of ChristianWay Baptist Church (CWBC) located in Falls Church, Virginia since September 1995. A native of Arlington, Virginia specifically from the Green Valley community. He currently resides in Fort Washington, Maryland. Pastor Henderson matriculated his theological education at the Wilbur H. Waters School of Religion and Theological Seminary in Washington, D.C. He earned a Master of Theology in May 2011. He received an Honorary Doctor of Divinity Degree, November 2018. 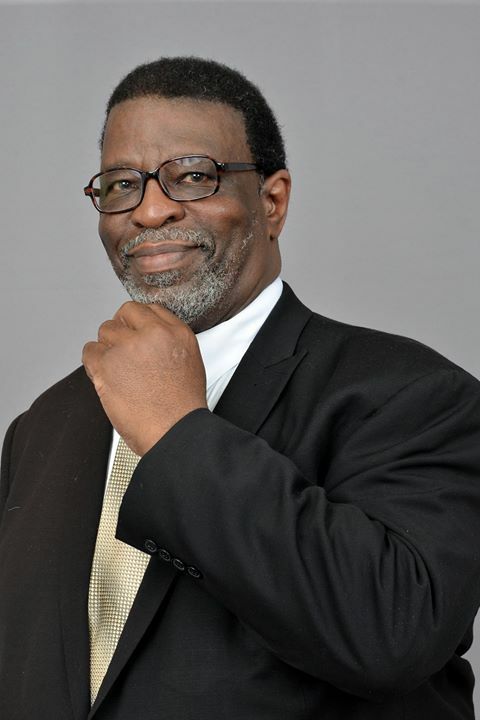 After completing his studies, Pastor Henderson served as an instructor and was honored in October 2011 with the Distinguish Alumni Award for his exemplary ministry work accomplishments in the faith based community reflecting positively upon the seminary. He presently serves as the Chair of the Board of Directors of the Wilbur H. Waters School of Religion and Theological Studies Seminary. 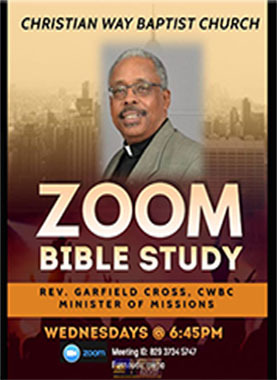 He was licensed to preach the Gospel in June 1980 under the leadership of Bishop Carroll Baltimore, who was the Pastor of the Mount Pleasant Baptist Church (MPBC), and was Ordained in June 1994 at MPBC. As Pastor of ChristianWay Baptist Church, the Holy Spirit guided him to develop and change all departments, boards and auxiliaries into Ministries with the focus on Service and Kingdom Building. Under his Pastorate leadership the following ministries were formed: Marriage and Family Enrichment, Christian Counseling, Women's Ministry, Men's Ministry, Singles Ministry, Prison Ministry, Youth Ministry and Media Ministry with the creation of the Christian Way website. He appointed the first Minister of Music and was instrumental in the formation of the Gospel Chorus. Under his Leadership the first revival was held, retreats were established for the Men, Women and Youth Ministries to include co-ed retreats with congregational churches in areas located in North Carolina and Pennsylvania. Many laymen have been trained to teach and exercise their spiritual gifts inside and outside of CWBC for the use of serving others. Pastor Henderson is serving as the Moderator for the Northern Virginia Baptist Association. He has served as President of the Baptist Ministers Conference of Northern Virginia and Vicinity from September 2006 to September 2008. Pastor Henderson favorite scripture is II Corinthians 5:17 "So if anyone is in Christ, there is a new creation: everything old has passed away; see, everything has become new!" You can use PayPal to make a secure, online donation to ChristianWay Baptist Church. If you don't have a PayPal account, you can set one up, or you can use your credit or debit card to donate. PayPal will email you a receipt. Pray daily for your Pastor and the Christian Way Family. Be a consistent tither and giver. Share the gospel with as many people as you can. Continually to invite people as you can. 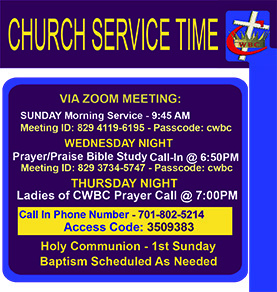 Commit yourself to Wednesday night Bible Study, Church School and Family and Marriage Workshop. Commit to personal Bible Study Live a holy life style. Get involved and be supportive in a church ministry. It is the dream of developing people to spiritual maturity through Church School, Bible studies, seminars, workshops and retreats.